Rackety wooden houses with shingled roofs in Tokyo’s Anjincho (安針町) in the Nihonbashi district. This image was published in the June 17 1872 issue of the newsmagazine The Far East, published in Yokohama by the famous Scottish publisher J. R. Black between 1870 and 1878. So we know this photo is at least as old as that date. 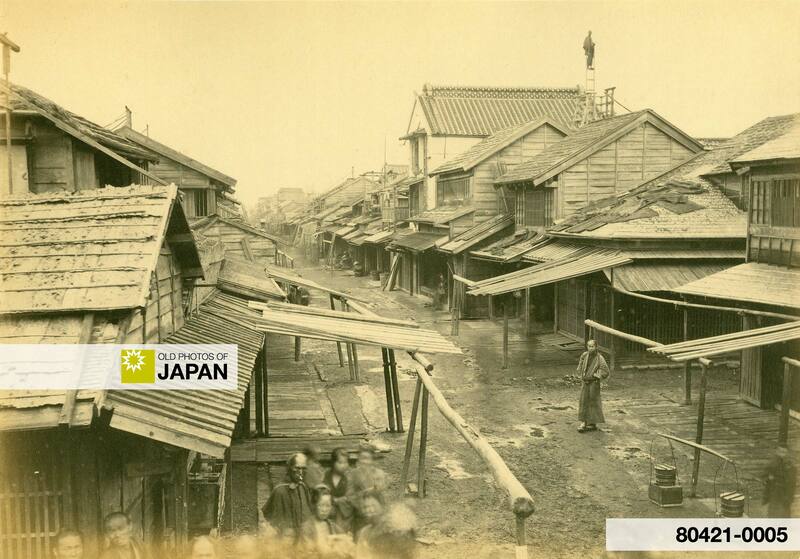 The area looks dilapidated and squalid, quite different from the views of Japan on the souvenir photos that were soon sold all over the world. These portrayed Japan as a land of infinite beauty and charm. Anjincho was named after Miura Anjin (三浦按針), the Japanese name for the English pilot William Adams (1564-1620) who served on the Dutch ship De Liefde which after many travails arrived in Japan on april 19, 1600. Although the Portuguese had been sailing to Japan since 1542, the De Liefde was the first Dutch ship to make it to Japan, while Adams was the first Englishman. Adams, who was born at Gillingham, in Kent, had studied shipbuilding, astronomy and navigation, and served under Sir Francis Drake before becoming a pilot. In 1598 he signed up with a fleet of five merchant ships funded by Rotterdam merchants to develop trade relations in Asia. Only the De Liefde managed to reach Japan, and then barely. When it finally reached land in what is today Usuki City in Oita Prefecture, just nine of the 24 surviving crew members could even walk. Adams eventually earned the trust and friendship of Shogun Tokugawa Ieyasu (1543-1616), who was attracted by his knowledge of Western shipbuilding and nautical navigation. After building two Western style ships for the shogun, Adams became his advisor on trade. He was given hatamoto (personal retainer to the Shogun) status, which made him a samurai, and received the name Miura Anjin, as well as a large estate in Hemi (逸見), now part of Yokosuka City. Adams is the only foreigner ever to have been a hatamoto. Adams also had a residence in Edo‘s Nihonbashi. In his memory, a small area here was named after him, Anjincho.1 The location where his house used to be, 1-10 Nihonbashi-Muromachi, was designated a historic site in 1930. A simple monument, erected in 1951 and tightly squeezed between two buildings, can be found here.2 It is near the A1 exit of the Mitsukoshimae subway station (Ginza and Hanzomon lines), just North East of Nihonbashi Bridge. The Google map below shows the location of this monument. The area is not only famous because of Adams. About half a century after the death of Adams, in 1673, an ambitious man by the name of Mitsui Takatoshi (三井高利, 1622–1694), opened a large gofukuya (kimono shop) nearby where this photo was taken.3 This business would eventually grow into the international department store chainMitsukoshi, while Mitsui himself became the founder of what is now known as the Mitsui conglomerate. The first private bank in Japan, Mitsui Bank, was founded by this company on July 1, 1876, just four years after this photo was printed in The Far East. 1 Japan Local Government Centre, Japan-UK Memorial Seminar William Adams, St Mary Magdalene Church, Gillingham, ME7 1SS. Retrieved on 2009-07-03. 2 Chuo City Tourism Association, Site of Miura Anjin’s Mansion (Japanese. Retrieved on 2009-07-03. 3 古今・お江戸日本橋。日本橋”町”物語（町々の歴史） – 室町・本町。Retrieved on 2009-07-03. 4 Map showing how Anjincho has changed. You can also licence this image online: 80421-0005 @ MeijiShowa.com.